But none of these sightings compare to watching a mountain lion enjoy an elk kill while a dejected wolf – possibly the hunter – watched from a safe distance. Such is the pecking order of the critter kingdom in Yellowstone National Park. There are no more than 35 mountain lions in Yellowstone National Park. It was frigid that early morning in the northern region of the park. I’m talking 20-below frigid. My small group had already been out in the cold for an hour or so with only marginal wildlife-spotting success. We were ready for some java. Or a round of Bloody Marys. As we were heading back to Mammoth Hot Springs we passed a pull-out with one parked car and four people jumping around and high-fiving. We turned around, set up our scopes and watched for the next hour as a mountain lion about a mile away gorged on an elk. A wolf, probably ravenous, watched from 50 yards away while the mountain lion lazily chomped away on what was probably meant to be the canine’s breakfast. The National Park Service estimates that no more than 35 mountain lions dwell in the 3.2 million-acre park. That’s one mountain lion for every 91,428 acres. You can understand why my fellow wildlife-watchers and I were so excited. While wildlife sightings like that are clearly extremely rare, there are plenty of opportunities to spot wildlife in Cody Yellowstone every season of the year. For visitors, it’s another welcome reason to experience the Great American Adventure here in northwestern Wyoming. For locals it’s another reason why we stay. Visitors often ask the best way to see critters in the wild, and here is what I tell them. -If you can, go with a guide. 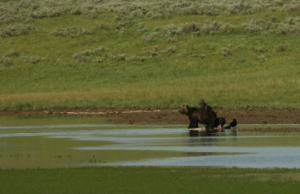 There are numerous companies in Cody Yellowstone that offer guided tours of Yellowstone National Park. The guides usually do the driving, and they tell you about what you’re seeing. You sit back and relax while enjoying one of the best-known landscapes in the world. -Always observe animals safely. 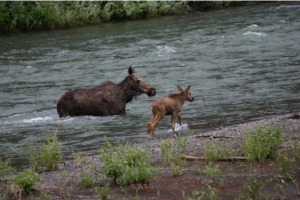 The National Park Service recommends that you stay at least 25 yards from wildlife like elk and bison and at least 100 yards from bears and wolves. Heed this advice, please. The National Park Service advises visitors to stay at least 100 yards from black bears and grizzly bears. -And use common sense. Watch with binoculars, back away from wildlife approaching you and be courteous when pulling off the road to get a better view. Until next time, I’m polishing my scope and loving life here in Cody Yellowstone.